There's a theory about board games that says you should only own those games are the best of their genre, type, or purpose. For instance, if you're a fan of worker placement games, you may have Puerto Rico, Lords of Waterdeep, Leonardo Di Vinci, and Agricola in your library. Jones Theory states that you should pick your favorite and divest yourself of the others to keep your board game library small and ensure you play only the best games. Coup fits perfectly in my collection as a short game for a maximum of 6 players that's incredibly fun (the most important thing!). It's also among the best hidden-role games that exist, regardless of length. As Coup is also among the very best "light" games I've ever played, I theorize that it will be in my library for years to come. In Coup, players compete to survive and eliminate each other until one player remains. Players take actions each turn, most of which "represent" a specific role in the game. These actions typically serve to gain coins that are spent on future actions, or to use coins to eliminate other players. A player is eliminated when he or she is forced to discard their last card. Some of these actions (Tax, Assassinate, Exchange, Steal) are associated with specific roles in the game. In the same way, the defenses (Duke, Ambassador, Captain, Contessa) are also associated with these roles. 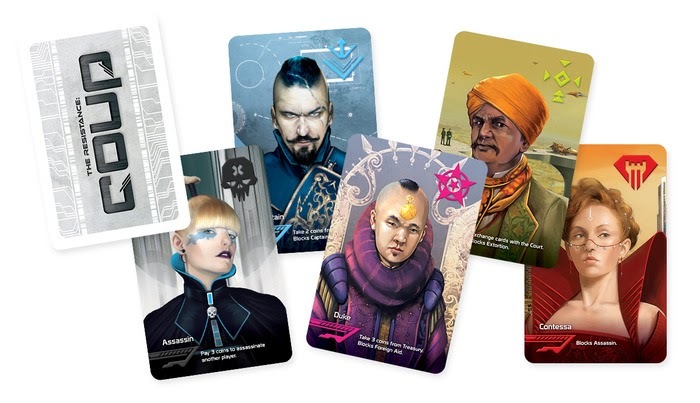 Any play may invoke their abilities at any point during the game, regardless of whether the player actually is holding the associated role card. There's a benefit - and a risk - to lying, so be careful! As explained above, these roles are associated with various actions and defenses. Each turn, the active player takes one action from the available actions, and announces it to the table. Every other player has the right to accuse the active player of lying, that is, of taking an action without having the associated role card in their hand. If the accusing player is correct, the active player must choose and discard one of their role cards. If the accusing player is incorrect, the active player must reveal the role card associated with their action, then shuffle that card into the deck and draw a new card. The action is carried out successfully, and the incorrect accusing player must discard a card face-up on the table. If the active player is taking an action that affects another player (like the Captain or the Assassin), the player affected can "block" the action by representing the Role with that defense (like the Contessa, who blocks Assassination). Again, any player may call this bluff, and normal rules apply. Strangely enough, the rules of Coup seem more complicated when written than when simply demonstrated. It typically takes a player a round or two to fully grasp the workings of the game, but fortunately a round of Coup typically only takes a few minutes to complete. The guys at Indie Boards and Cards packed a lot of strategy into a simple 15-card game. The five roles compliment and contrast each other well, providing interesting decisions for the active player (to bluff and take the best possible move, or to tell the truth and take a less useful move... or to bluff and take a less useful move, and throw everyone off your trail) as well as for the opposing players. I've found that it's very difficult to "know" when my friends are lying, even though we've played Coup together at least a hundred times. 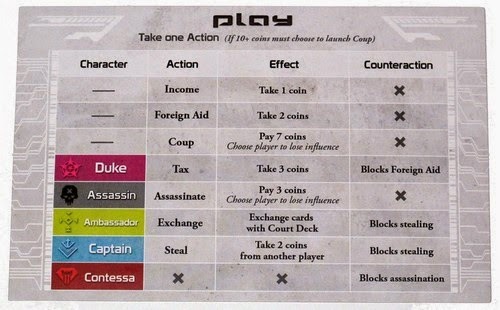 1) Gather coins quickly by representing the Duke and/or the Captain, then using the coup action to take out opponents. This is typically a high-profile play, and will usually draw a lot of attention. It's hard to win this way because it's pretty easy for players to gang up on a single opponent, and having a large stack of cash is an easy way to become everyone's enemy. 2) Collect coins slowly and Assassinate opponents occasionally, or only when absolutely needed. The "slow" game is generally a more fruitful path, if you're the type of person who can lay low and avoid being targeted. 3) Use the Ambassador, Captain, and Contessa to block any and all attempts at hurting you, then try to bluff your way into enough coins to win in the end game. The Ambassador's action is the least threatening action at the table, and usually is one that no player will challenge. It's a great way to set up a useful defense and lay low for long enough to let the game shrink, thus making a single assassination or coup more powerful. 4) Tell the truth all the time and see what happens. Coup is a wonderful game for many reasons, not the least of which is that players of all styles can enjoy the game together. I'm a brash, confident, loud game player, and I love to draw attention to myself and control the game when possible. I'm a fantastic bluffer (at least, I think I am) and I absolutley LOVE to get inside other people's heads in a game. Not surprisingly, I don't win many games of Coup, as I draw most of the attention to myself and get eliminated pretty quickly. That said, sometimes I'll take the third strategy and sit tight with defensive cards, even to the point of lying about my role to make myself seem less threatening. Though it doesn't happen often, I've even gone so far as to allow someone to steal from me while I had the Captain, then used the Captain's action on my turn. Obviously players assume I'm lying, call my bluff, and then are rewarded with a lost card when I flip my goateed hero onto the table. My absolute favorite thing to do in a game of Coup is to simply not look at my cards until a player calls a bluff. Some feel this is a breakdown in the game, but I think it's an interesting exercise in bragadocio and reading a table. Players are immediately put in a position to risk their cards to challenge me, and each player should instinctively know they have a decent shot at taking me down a notch. Still, it's a scary proposition for most players. I play first, and don't look at my cards. There are three possibilities that players could have that would affect their decision to call my bluff. Because I haven't looked at my cards, there's no possible "tell", so players are forced to decide based solely on the odds. Players can't show their hands to each other, so even if three players each have one Duke (there are only three in a deck), none of them individually know that I have to be lying. Two cards, each of which could be a Duke. The probability of neither of my cards being the Duke is equal to the probability of the first card not being a Duke times the probability of the second card not being the Duke. This probability of the first card is 10/13, since there are 13 cards not in the player's hand, and ten cards that aren't the Duke that are not in the player's hand. The probability of the second card not being the Duke is 9/12, as the first card in my hand is not a Duke, and there are now nine cards left unaccounted for that aren't the duke. 10/13 * 9/12 = roughly 58% probabiltiy of neither of my cards being a Duke. Thats about a 4/7 chance of my not having a Duke in hand. Probability of my first card not being a Duke: 11/13 (there are only 2 dukes left in the deck). Probability of my second card not being a duke: 10/12. 11/13 * 10/12 = roughly 71% probability of neither of my cards being a Duke. That's about a 5/7 chance of my not having a Duke in hand. Probability of my first card not being a Duke: 12/13 (there is only 1 Dukes left in the deck). Probability of my second card not being a duke: 11/12. 12/13 * 11/12 = roughly 85% probability of neither of my cards being a Duke. That's roughly a 6/7 chance of my not having a Duke in hand. In each of these possibilities, my opponents have to decide whether it's worth risking one of their cards - half their lives in the game! - to challenge me and possible take out half of mine. Assuming it's a 6-player game (most of ours are), the player who wins can lose no more than one card, while all other players lose a total of 10 cards. If we apply a little approximate math, that means a player who wants to win should never risk more than a tenth of a card to challenge another opponent - in math terms, a player shouldn't challenge at the start of the game unless there's a 90% chance the player will win. The odds relax as the game progresses, and are fluid at best since bluffing is a huge component of the game. In a way, Coup can be played a bit like poker - though the odds aren't everything, understanding when they are and aren't in your favor can have a huge affect on how successful you are in the game. All that rambling math is just to say that there's deep strategy in Coup if you want it, and it can be incredibly rewarding to bluff your way to victory against the odds. That said, I've got plenty of friends who couldn't sell fishing line at a Bass Pro Shop, and they have fun playing Coup too. It really is for everybody, something that many in the genre can't claim. 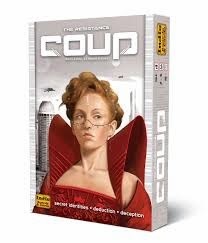 Coup is a fantastic game of deduction and bluffing that fits a very difficult niche in gaming - the 5-6 player game that's actually more fun with more players, and still strategic and interesting. For $15 it's a must-have in every collection, and I keep multiple copies in my library in case I need a quick present for a gamer's birthday. Go buy it now!